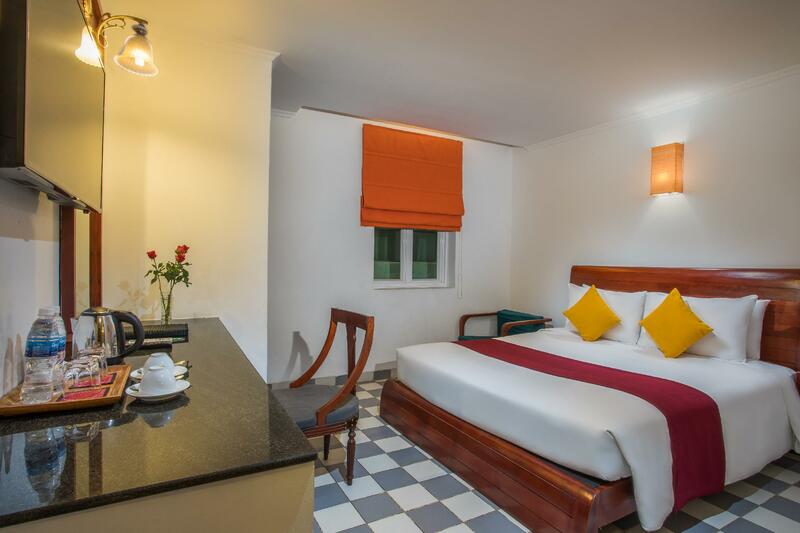 Το V Hotel Phnom Penh είναι μια πολύ καλή επιλογή για τη διαμονή σας σε Πνομ Πεν, είτε είστε τουρίστας είτε επαγγελματίας. Από εδώ, οι επισκέπτες μπορούν να έχουν άμεση πρόσβαση σε όλα όσα η πόλη έχει να προσφέρει. Από τη βολική της τοποθεσία, η ιδιοκτησία προσφέρει εύκολη πρόσβαση σε κορυφαίους προορισμούς της πόλης. 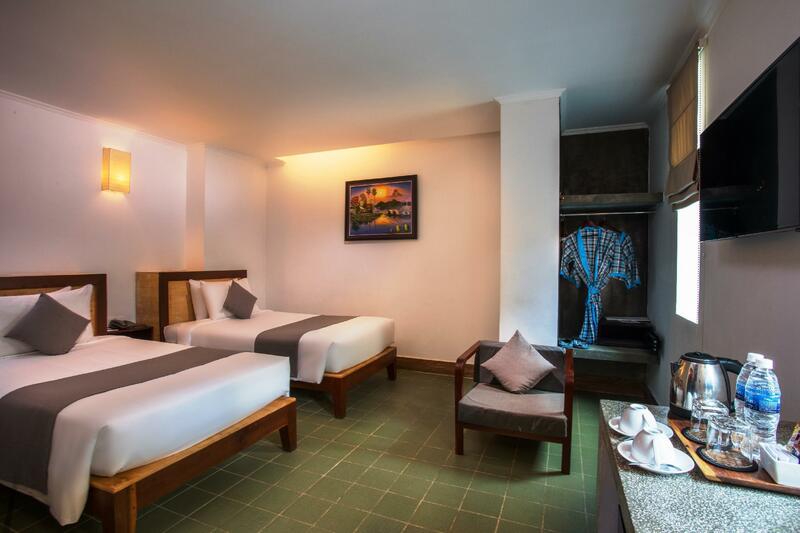 Το V Hotel Phnom Penh προσφέρει επίσης πολλές εγκαταστάσεις για να εμπλουτίσετε την διαμονή σας στη Πνομ Πεν. Μια επιλογή από εξαιρετικές ανέσεις όπως τα 24ωρη υπηρεσία δωματίου, 24ωρη φύλαξη, παντοπωλείο, ημερήσιος καθαρισμός, δωρεάν WiFi σε όλα τα δωμάτια σας περιμένουν στο ξενοδοχείο. Η ατμόσφαιρα του V Hotel Phnom Penh αντανακλάται σε κάθε δωμάτιο. Στην ιδιοκτησία θα βρείτε επίπεδη τηλεόραση, κρεμάστρα ρούχων, δωρεάν καφές φίλτρου, δωρεάν τσάι, τζάκι, καθώς και πολλά άλλα. Το ξενοδοχείο προσφέρει μια άριστη ποικιλία ψυχαγωγικών εγκαταστάσεων, όπως τα υδρομασάζ, εξωτερική πισίνα, εσωτερική πισίνα, σπα, μασάζ. 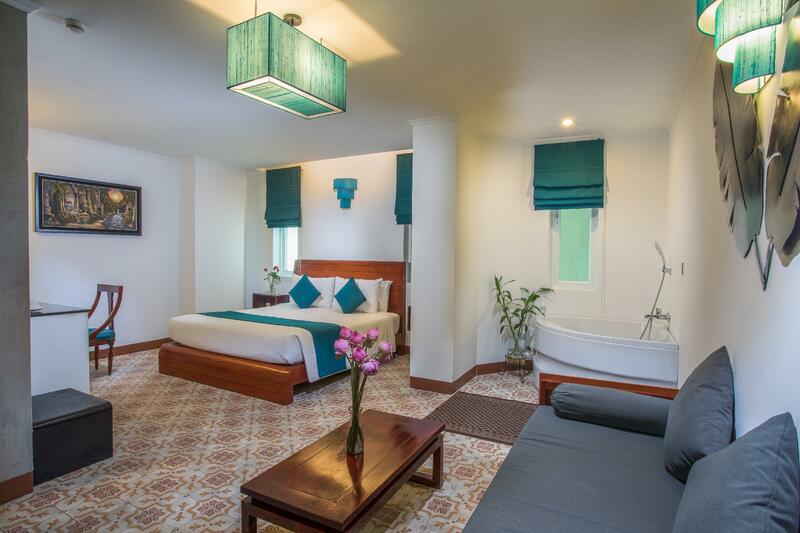 Το V Hotel Phnom Penh είναι ένας ιδανικός τόπος για να μείνετε αν ψάχνετε για γοητεία, άνεση και ευκολία στη Πνομ Πεν. Διατίθεται υπηρεσία μεταφοράς αεροδρομίου με χρέωση 8 USD ανά όχημα TukTuk και ανά διαδρομή (έως 2 άτομα). Παρακαλείσθε να επικοινωνήσετε με το κατάλυμα για περισσότερες λεπτομέρειες. 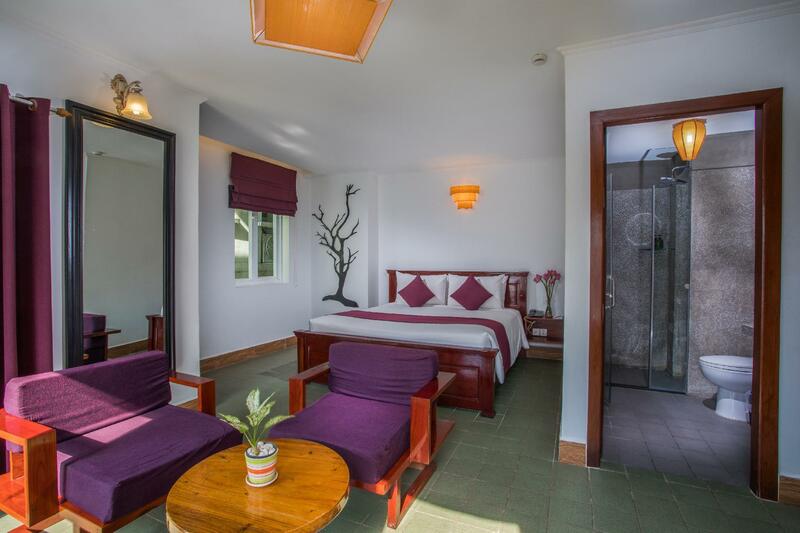 Rooms are a good size with all the facilities you need. Staff are friendly and try their best to help. Lift is slow, one to 16 floors so takes a while. Breakfast isn’t great. 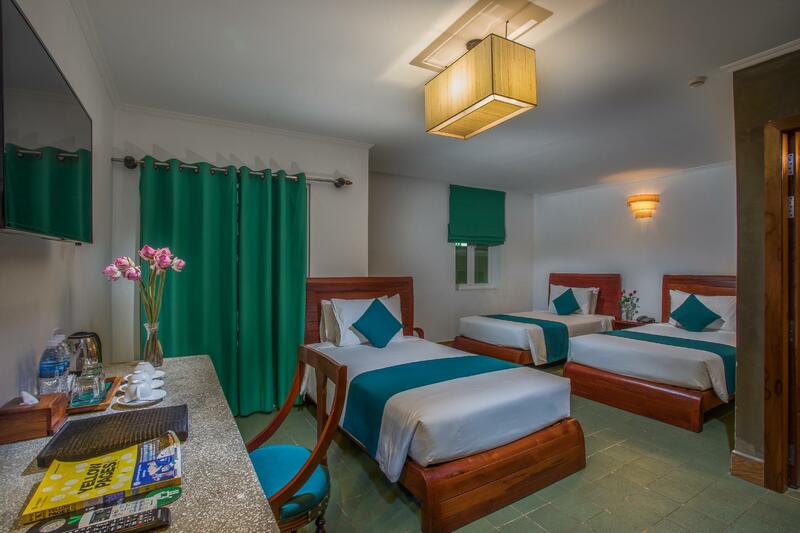 Great location, clean rooms, clean towels. 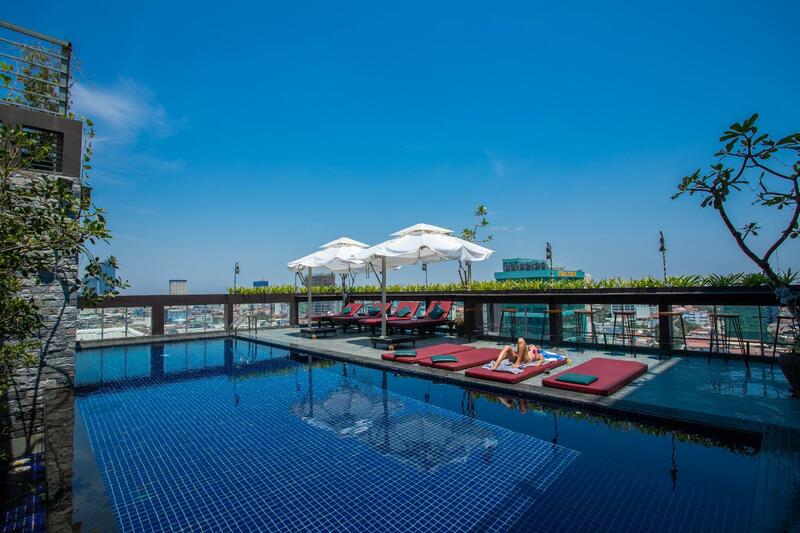 Decent bar and pool on the rooftop. English could be an issue but u can’t expect much when in a non-English speaking country. Overall, definitely will stay here again. 5 stars all around. the room was very spacious, clean and well designed. big downside is that the small windows were blocked by the immediate next building, so even with a room on the 14th floor there was nothing to see and barely any daylight. I've lived in hotels through Cambodia for 1.5 years straight now - and this is by far the best hotel experience I've ever had in the entire country. First off, the nicest staff anywhere. The facilities are very modern & extremely nice. Beautiful room! And beautiful view! Breakfast was great, spa was great. Room service & food was awesome. Loved the rooftop pool and skybar/restaurant/gym. 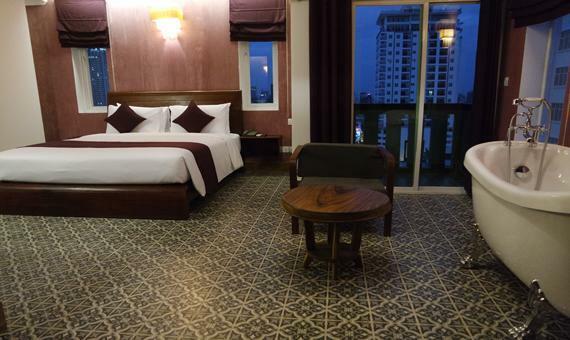 My personal favorite hotel in Phnom Penh & all of Cambodia - after 1.5 years of living only in hotels. Can't wait to stay again some day! For our purposes, the V Hotel is okay, but just okay. We live in Siem Reap, Cambodia and visit Phnom Penh for business, medical and Embassy (I am American) issues. 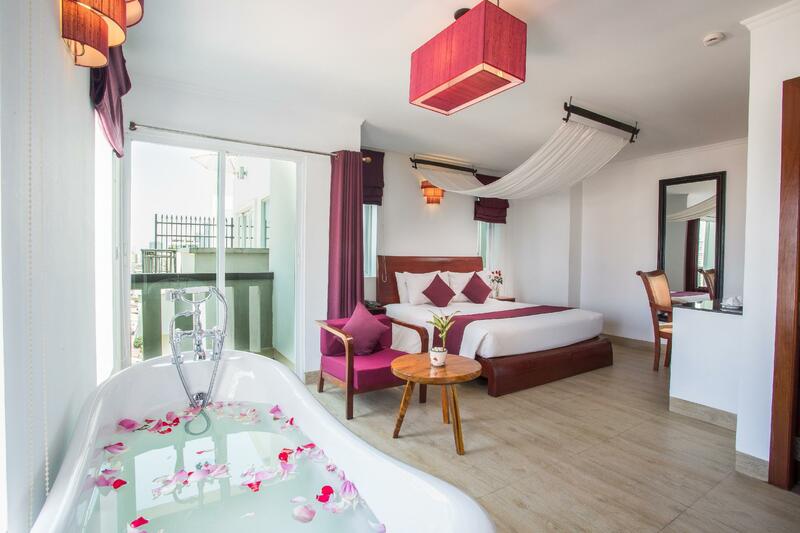 The V Hotel is a good choice when you want to spend at the level of Mid-priced Hotels (at the lower end of that range), have a few creature comforts, good bath facilities, a firm mattress and, hopefully a pool. Hey, it can't be bad if my ONLY complaint is the elevator which is extremely small and slow enough to outrun, using the stairs because the lift was too full of people to get in! One other comment is about breakfast. This is in response to a reviewer who said the breakfast at the V Hotel was, "better than the usual hotel breakfasts in her experience." In my experience the buffet breakfast was poor. All the hot foods I tried(4) were cold and the Fried Eggs were STACKED. As a retired chef I couldn't believe ANY restaurant person would stack fried eggs! Their toaster was the best I've seen in Cambodia. The breakfast was good. The staff was helpful and friendly. The water was floating all over the bathrooms floor when showering. Is very slippery around the pool area, and a bit dangerous for the kids to get around. We had a nice stay. Location-wise, V hotel is not the best as there is nothing much in its immediate surroundings. But since they have a tuk-tuk, going around is quite convenient. The tuk-tuk driver is excellent and offered to pick me up every time - with no extra charges for having to wait or anything. If each leg of the journey costs 3 $, I would be charged the exact 6$ upon returning to the hotel. At check in, I was upgraded, free-of-charge, to junior suite - the highlight of this stay. All front desk staff, tour desk staff, restaurant staff and house-keeping were super friendly and warm and very polite and courteous - genuine, not merely doing their job. The only negative comment would be the breakfast, very few choices. Inclusion of more traditional food in the menu would be a plus, as there are less than 5 items of real traditional Cambodian cuisine. 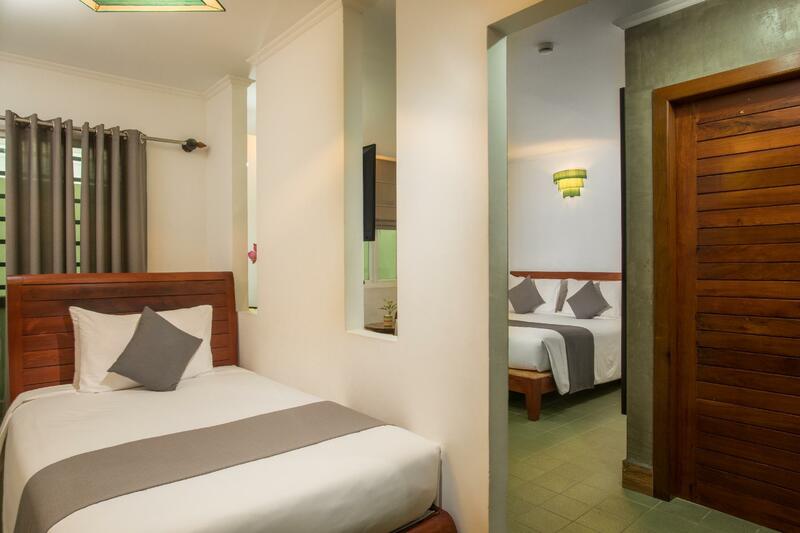 Overall, an extremely pleasant stay and highly recommended choice of accommodation in Phnom Penh. Walking distance to all kinds of fantastic places to eat and coffee hang outs. Staff is incredibly helpful. Rooms comfortable especially on the side of the building w/o construction next door (the only reason for a four star review on facilities). I got the room through a special promotional deal, and it was excellent value. Cost me about the same as I would've paid for a similar room at a 2 start place. The room was clean, extremely comfortable. The staff were helpful and polite. Even though I was only on the fifth floor I still had a nice view. The cons: the hotel is not in a fantastic area, in that there's no decent restaurants or shops, and getting anywhere requires a tuk tuk ride. Also, it's a big hotel, and there's only one elevator between all sixteen floors. Sometimes it takes forever to get back to your room. This is a boutique hotel. We (5 person) arrived at the hotel in a van (25USD) arranged by the hotel. The friendly receptions welcomes us with drinks and arrange an early check in for us. Overall, the hotel food are tasty and they offer 10% discounts for food and beverages to their customers. The breakfast has limited choice but generally we are satisfy with it. They offer American breakfast, noodle soup and fried rice (have to order from the menu), bread and butter, fruits, yoghurt, cereals, salad and drinks. Rooms are clean and spacious. The rooms in each floor has different wall colours (we stay in level 11, level 12 & level 14 respectively), room has a bath tub (we like it so much) which is a good relaxation after full day meeting. Once you get out from the lift, you will see different wall decoration, we like it too. Hotel provide in-house tuk tuk service with the price listed clearly. For example, if you would like to go shopping at Central Market, the tuk tuk charge USD2 per way but they could wait you for 1 hour and you just need to pay extra USD1 for that. The hotel offer teeth whitening services at USD5 but unfortunately we have no time for that. The hotel has massage services at reasonable price. Everything is good except the construction nearby working 24 hours which is so annoying but the hotel did take action and also offer to change the room for us. Overall, we were satisfy and will definitely come back again. The bathtub in the room ( not in bathroom) was so good. The unique style of room made me so happy and exciting. Staff are so so kind and everything was more than 5 star hotel. Location is not so bad as you can go kiwi mark in 1 mn, but still far from the riverside, tourist area. It is a difficult hotel to rate. The staff were very friendly, in particular the spa staff, the rooms were nice, modern and clean, with great bathrooms! The restaurant was nice and the pool area was ok. All in all it was very good value for money. However, one evening as we were heading out there were 8 people in the lift going down. This was well below the 11 people maximum and the weight capacity stated. As we got to the bottom, the lift dropped a metre or so and we were trapped in there for about 5 minutes wondering how we were going to get out. They were eventually able to pry the doors open, and we climbed out. The staff were mildly apologetic and seemed to indirectly blame us for having too many people in the lift (not according to the information in the lift and a lift shouldn't work if there are too many people in it). The staff didn't mention it again and there were no complimentary drinks when we were left visibly shaken from the experience. We didn't know whether the elevator cable had broken or whether we could've dropped from a higher floor. We spent the rest of the time avoiding the elevator and taking steps - my room was on the 10th floor. So it was a good hotel, but we all felt like we narrowly avoided a terrible accident. Difficult to rate therefore. The property is brand new, but you can feel that will not stay up to the hype for long... Building is smell dusty and humid. The main problem to not ignore is the costruction site, rising right next to it... For the next couple of years they will face a lot of complains and noises... I had to change rooms in 3 days stay...Pretty shame because overall there is not too much else to complain about it... Staff good to handle problems, smiling and positive spirit. Pros: great location : nice shower and bathtub : good breakfast : lovely pool area with awesome views Cons: A.C. took very long to cool the room down. : the fridge in the room didn't manage to keep anything cool/ cold. The hotel in itself is nice as well as the staff but, there’s nothing surrounding the hotel that is of interest to tourist like restaurants, cafe, or places to see. It’s very far from everything. You will have no choice but to order in the restaurant or do food delivery. Cleaning is done everyday, but for the 3 nights we stayed, our beddings wasn’t changed. Only used towels were changed, even the pizza box from day 1 stayed until we checked out on the 4th day. Breakfast need a total revamp. If you don’t have the noodle soup you’ll end up eating vegetable fried rice or bread. Really not much choices. But if you plan to just stay in and not go to other places this is great. The pool is good. My kids enjoyed it. I’ll repeat, staff are good. Some can speak English. So it won’t be a problem for non local speakers. The bath tub in the middle of the room was a hit with my kids. Σταθμός Λεωφορείων Capitol στα 0.38 χλμ.